A very small black panther, a patch of black which eats light, lies at my side. It has green eyes and the languid air of a seasoned explorer returned home. He has had a busy day. Because after an eternity of dithering, Clive Bond, the family cat, has mastered The Outside. The development follows a considerable amount of sizing up Out There to see what it’s made of. And also, a fair amount of sitting next to the cat flap contemplating it. The cat flap. An exit one has to nudge open with one’s face; and which, once you have edged gingerly through, shoots forward to spank you on the bottom as a parting gesture. I wonder, would humans use it? They are everywhere, and like those who use them, have been for millennia. Farm cat doors – made to welcome ferals in to hunt the mice – are still visible in France and Spain. The Spanish call them Gateras, the French – my favourite – chatiéres. And cats got the better of Isaac Newton and his genius if one fairy tale about him is to be trusted. Contemporaries report he never had cats or dogs. But folklore has retained the story that this genius of physics had a foolish regard for a cat and her tiny offspring, who arrived at his house one day. And when he came to offer them hospitality and make cat flaps, he made a large one for the mother; and a tiny one for the mewling kittens of the family. And whatever the tale’s provenance, there are indeed two holes in the door which used to be Isaac Newton’s at Trinity College, Cambridge, blocked up to protect today’s central heating; one large one, and one tiny one. So these cat flaps have a pedigree, so to speak. Whilst the Oxford Dictionary only referred to cat flaps for the first time in 1957, our feline friends have been referring to them for millennia. Clive has tackled the robust physicality of the cat flap by staring fixedly at it for weeks. He knows it carries the many siren secrets of the garden. But he is equally aware it requires brute force to operate. This should not be a problem for Clive. He has been punching the dog for months. But Clive’s little grey cells move slowly.It has taken a long time to come to terms with the whole concept. When he finally took the plunge, it was with incredible mystery and panache. For none of us knew a thing. There was Phil, standing in the kitchen one day in the week, and the cat walked in through the cat flap. As if there was nothing at all surprising about him emerging from The Outside, where he had rarely stuck a toe before now. And yesterday, Saturday, he took full advantage of humans being around. Not only did he show the cat flap who was boss, he took a stroll down the drive and into suburbia. Clive has surveyed his world, and when he arrived he – usually the strong silent type -spent some considerable time telling Phil all about it. The Outside. It’s a brave new world for Clive Bond. Posted in Clive BondTagged cat flaps, cats, england, petsBookmark the permalink. That little episode makes me miss our cats. All three of them had totaly different approaches to the cat flap – total disregard, disdain and all consuming fear. Funny, isn’t it, Roger? Everyone is different, and that includes felines. Amazing what has endured since mediaeval times, Tilly! Hope you’re feeling one hundred times better. Sun’s shininng here today. I can smell Spring. better every day the sunshines thanks:) younger and older cat and moi drew up a new contract when we met – Kipling’s was way out of date we felt – cat flaps they remind daily were not included:) they come home when called, give up night time carnage, desists(mostly) from killing the furniture (younger cat is a little hazy on that one) in exchange I feed them, let them sit on my typing arm and protect them from the cold – seems reasonable to them:) (they are lucky I tell them often that I do not go out to work! The Isaac story seems preposterous, notwithstanding the hole proof! So when Clive wants to return indoors, he gets into a flap about it? If he is like our character, the last recourse employed under great protest if there happens to be a human nearby to give orders to. It is so much fun watching Bond grow up and take on new adventures, thanks for being our eyes and ears, Kate. Our first cats mastered the flap (which gave them access to a screened porch and their litter boxes) in a day or two. Tigger, in contrast, had no need to learn until we moved to Florida and installed one to the screened patio in our first apartment. At age 4, he was used to asking us for all he needed and was uninclined to master this new skill. Instead, he cried until we opened the door for him. Now that Clive has mastered the flap, watch out what the cat drags in! This is great. I am a sucker for anything about cats, but the image of the drafty holes of old will stay with me, as will the larger and smaller for the little kittens. I was surprised about the amount of lore that surrounds cat flaps. I suppose we should not be surprised. Cats have been around for long enough, and have their own rich lore. Clive Bond is lucky as he has wide open spaces to explore. Here in suburban Florida, gators are one excellent reason why our cats are indoor cats. But that practice really began when we still lived in New York. Tumbleweed, who lived to be 17, kept fairly close to us. She’d walk behind me down to the stop sign and then go no farther. Then, on one outing, she didn’t return for several days. We were told she was cat-napped by a most unlikely source, and then released. Once home, she never strayed off our block again. Thank goodness she made it home! I’m not sure I’d rate Clive’s chances in a city…but here next to the forest the world is full of sights and smells to bewitch a cat. The rest of the cats in this area are very savvy; we’re hoping Clive will be the same, and first indications bear this out. How lovely that Fat Lily cares, Jan! We had a cat flap in our old house, only it went down to the basement where the kitty litter box was. It was, on occasion, used by most of the children in the neighborhood, however, who found it quite a lot of fun to pretend they were cats. Fortunately, no one tumbled down the stair, but, all meowed and purred and hissed! Miss that old cat flap. My cats never had a cat flap. I just got up and down to open and close the door. Frequently. Indoor cat William darted out one day while the door was open but within ten seconds chose to run back into the house. The story about Newton is delightful, whether it’s true or not. But after seeing the gator, I will never never never have any door that doesn’t stay locked. I’m not likely to wake up to a gator, but opossums and snakes might come in. And raccoons. And the neighbor’s cat, who seems to like us a lot. It juts shows how incredibly tame our English landscape is, Kathy! We have nothing to fear coming through cat flaps.. 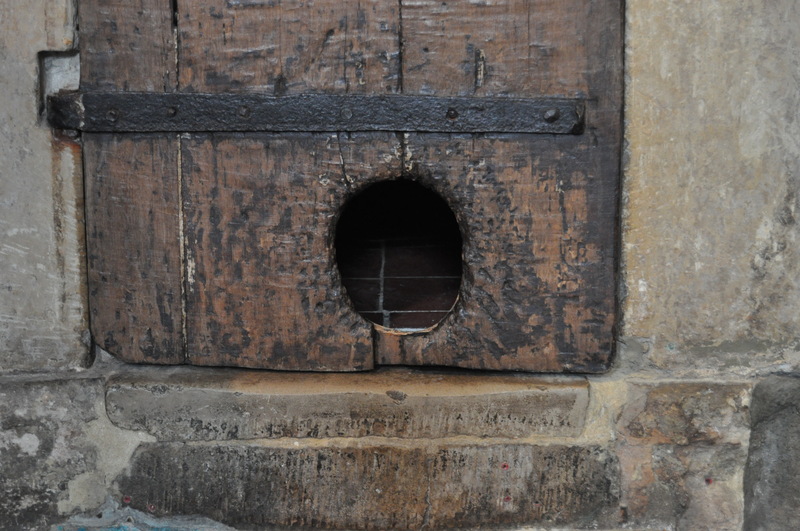 Such a simple thing, and yet I’d never thought about cat flaps being used centuries ago. My cat is strictly an indoor kitty. Too many bad things can happen to cats outdoors in the city. It’s a jungle out there, PT: and if your cat is content that’s what matters. 😀 he makes me laugh, Andra. He disappears out for only ten minutes and comes back with a tail like a toilet brush. Clive Bond, secret agent and world explorer. “He has been punching the dog for months.” Nice to know that Mac has been contributing to Clive’s fitness routine. It’s been like a scene from Rocky, Lame. Which one of them is Apollo Creed? Or, do they take turns? Is there any creature on earth who dithers more than a cat? I don’t think so. Doors and flaps pose a particular challenge for them, for sure. Congratulations on the adventure, Clive Bond! The dithering is all part of a great big conspiracy, I am convinced, Weebles. Their ability to sit and stare fixedly at something for hours on end freaks me out. I am surprised that cat flaps have only been in the dictionary since ’57. It seems that they would have been known for centuries. The hole, yes Stephen, but not the flaps. Folks obviously did not mind draughty houses like they do today. I’m the cat door person. Because of Duc’s hunting prowess, I cannot have a cat door. Fortunately, Duc and I seem to be on the same wave length and I usually sense when he wants in. If I’m distracted from my duties, he pounds at the window. In the middle of the night, I practice “cat shove”. Duc wakes me to open the bedroom window so he can do night duty. However, he wants to stand half in, half out to check for danger, ghouls and ghastly predators. Who knows, maybe he’s heard of the gators in Nancyland. His surveillance does illicit a cat shove so I can ggo back to sleep. Trust you, Kate, for bringing this subject to such intriguing levels. Ah, you had me laughing out loud with Duc’s half-in, half-out strategy! Wonderful, Amy! I’ve had friends with cat flap stories that are a bit too risky for me! I don’t want to find an opossum in my kitchen. 🙂 I love the idea of Isaac Newton having had two holes in his door–even if it’s all folklore, it’s a fun thought. I enjoy hearing about Clive and his accomplishments. This was a great story! Erk. Just googles opossum and looked at those teeth and no, you don’t want an oppossum-flap! I must go to Cambridge and look for that door to get hard evidence. Ha! All part of a day’s work, isn’t it, Tandy? Our little ginger had been in an accident: on Saturday night, I found him with a nose bleed and a cut above his eye, and made arrangements for a vet visit on Sunday am. So we locked the cat flap to ‘in only’ and put Pippi out. During the night Pippi came in and wanted out again – so she broke the cat flap after head butting it for a while! It was old (about 19 years old) and fractured irreparably. I installed a temporary measure of a tea tray fixed in place with duct tape. So on Sunday after Greg had been to the vet (OK, but a little bruised after his altercation with a motorised vehicle) I went out to buy a new cat flap – an all pristine white cat flap to stop the draught. Both cats eyed the new window dressing with suspicion. It was stiffer to push than the old one, but they soon got the hang of it! Oh, Pseu, so sorry about your little ginger’s accident! I think cats know the flap is to their advantage. It’s all about becoming accustomed, I suppose.